The legality of online poker for American players is tricky sometimes because there is so much misinformation, misconceptions and misunderstandings out there. Americas Cardroom is a great option for US players, but many are left wondering if it’s legal to play there. The bottom line is that there are no federal laws making playing at this online poker room illegal, but we’re going to break it down for you in a way that’s easy to understand. There are two main federal laws that affect the legality of playing at this poker room. Neither of them makes it illegal to play online poker. However, they both are the subject of major misconceptions for a large number of people. Known as the UIGEA for short, this law was passed in 2006, and it made it illegal for banks to process payments for illegal online gambling. However, it specifically points out early in the writing of the bill that it was not making any forms of online gambling illegal, and this includes online poker. The UIGEA is often cited as a ban against any type of gambling on the Internet, and that is simply not true. Passed in the 1960s, the Wire Act was used as a tool against organized crime. The law makes it illegal to take bets for sports betting wagers over telephone lines. A court did rule that this included the usage of the Internet, and this led many to the misconception that it banned all forms of gambling online, including online poker for American players. The fact of the matter is that this misconception was so widespread that the Department of Justice had to address it specifically. In 2011, they made a public announcement that the Wire Act applied to sports betting only, and that no other forms of gambling were affected by it in any way. Although there are no federal laws that make it illegal to play there, Americas Cardroom is not regulated anywhere in the United States. Though there are only a few states that currently regulate any type of gambling on the Internet, and rooms like this one that offer their services to players all over the United States rock the boat quite a bit. 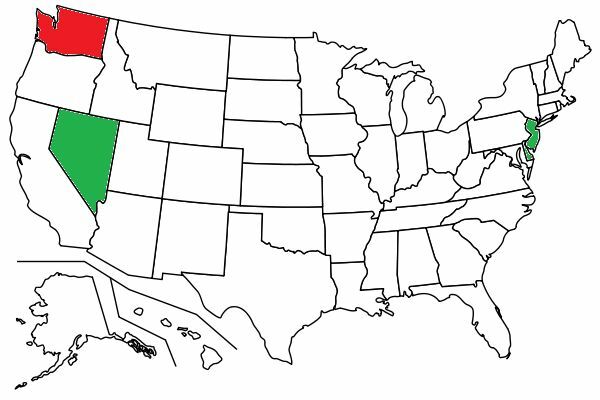 In the above map, states with regulated online poker are shown in green while states with laws specifically against online poker are shown in red. For the poker rooms that are licensed in those few states that have a regulatory body, Americas Cardroom represents unwelcome competition that cuts in on what they see to be their market. The truth of the matter, however, is that it gives players more choices, and that extra competition means that the regulated rooms have to keep up the level of service and promotions to keep up with great sites like Americas Cardroom. For players in the rest of the world, Americas Cardroom real money poker offers an opportunity to mix it up with US players. Online poker for American players was always an important part of the overall global poker economy, and since they were largely alienated from playing with those from the rest of the world thanks to Black Friday and big brands no longer accepting US players, the industry hasn’t been the same. Unregulated sites generally aren’t allowed in states like Delaware, New Jersey and Nevada that have regulated online poker rooms. Washington State is the only state to have an outright ban on the playing of online poker. Most other states have no laws addressing the legality of Americas Cardroom real money poker. Outside of the few exceptions mentioned above, there are no notable state laws regarding playing at this online poker room.